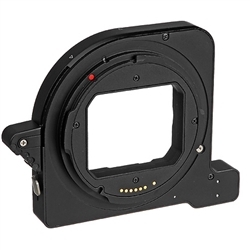 The CF lens adapter for the H-system allows photographers to use all Carl Zeiss C-type lenses from the V System on H cameras. Integral processors for data conversion bridge the two systems to access a number of the H display and lens-control functions. Functions such as autofocus and continuous drive are an integral part of the H System only so they are therefore not available when C lenses are used. Likewise, as the light measuring and aperture/ shutter controls are also different between the two systems, then camera operation differs too. Some other restrictions also apply regarding specific lenses or combinations of lenses/converters.